"Fabergé" redirects here. For other uses, see Fabergé (disambiguation). The House of Fabergé (French pronunciation: ​[fabɛʁʒe]; Russian: Дом Фаберже) is a jewellery firm founded in 1842 in Saint Petersburg, Russia, by Gustav Faberge, using the accented name Fabergé. Gustav's sons, Peter Carl and Agathon, and grandsons followed him in running the business until it was nationalised by the Bolsheviks in 1918. The firm was famous for designing elaborate jewel-encrusted Fabergé eggs for the Russian Tsars, and for a range of other work of high quality and intricate detail. In 1924, Peter Carl's sons Alexander and Eugène Fabergé opened Fabergé & Cie in Paris, making similar jewellery items and adding the name of the city to their rival firm's trademark, styling it FABERGÉ, PARIS. In 1937, the rights to the Fabergé brand name were sold to Samuel Rubin for the marketing of perfume. The brand name was then resold in 1964 to cosmetics company Rayette Inc., which changed its name to Rayette-Fabergé Inc. As the name was resold more times, Fabergé companies (such as Fabergé Inc.) launched clothing lines, the cologne Brut (which became the best-selling cologne at the time), the perfume Babe, hair products, and also undertook film production. The brand changed hands a few more times, and jewellery was eventually added back to the product lines. Next to branded Fabergé products, the world market has been continuously supplied with imitation "Fauxbergé" items and "Fabergé-style" products. Today, the brand is solely used for jewellery items and gem stones. The Fabergé family can be traced back to 17th century France, then under the name Faberges. The Faberges lived at the village of La Bouteille in the Picardy region of northern France. However, they fled the country during or shortly after 1685 because of religious persecution. An estimated 250,000 fellow Huguenots, as the movement of French Protestants was known, also became fugitives. During the family's progress eastward through Europe, its name changed progressively from Faberges through Favry, Fabri, Fabrier and then to Faberge without an accent. At Schwedt-on-Oder northeast of Berlin, in the second half of the 18th century, a Jean Favri (subsequently Favry) is known to have been employed as a tobacco planter. By 1800, an artisan called Pierre Favry (later Peter Fabrier) had settled in Pärnu, in the Baltic province of Livonia (now Estonia). A Gustav Fabrier was born there in 1814. By 1825, the family's name had evolved to "Faberge". In the 1830s, Gustav Faberge moved to Saint Petersburg to train as a goldsmith under Andreas Ferdinand Spiegel, who specialised in making gold boxes. Later, he continued his training with the celebrated firm of Keibel, goldsmiths and jewellers to the Tsars. In 1841, his apprenticeship over, Gustav Faberge earned the title of Master Goldsmith. In 1842, Gustav Faberge opened Fabergé as a jewellery store in a basement shop. Adding a diacritic to the name's final e may have been an attempt to give the name a more explicitly French character, to appeal to the Russian nobility's Francophilia. French was the official language of Russia's royal court, was widely used by the country's aristocracy, and Russia's upper classes associated France with luxury goods. Later in that year, Gustav married Charlotte Jungstedt, the daughter of Carl Jungstedt, an artist of Danish origin. In 1846, the couple had a son, Peter Carl Fabergé, popularly known as Carl Fabergé. Carl Fabergé was educated at the Gymnasium of St Anne’s. This was a fashionable establishment for the sons of the affluent middle classes and the lower echelons of the nobility, providing an indication of the success of his father’s business. Gustav Fabergé retired to Dresden, Germany in 1860, leaving the firm in the hands of managers outside of the Fabergé family while his son continued his education. The young Carl undertook a business course at the Dresden Handelsschule. At the age of 18, he embarked on a Grand Tour. He received tuition from respected goldsmiths in Frankfurt, Germany, France and England, attended a course at Schloss’s Commercial College in Paris and viewed the objects in the galleries of Europe’s leading museums. Carl returned to St Petersburg in 1872, aged 26 years. For the following 10 years, his father’s Workmaster, Hiskias Pendin, acted as his mentor and tutor. In 1881, the company moved to larger street-level premises at 16/18 Bolshaia Morskaia. Following Pendin’s death in 1882, Carl took over the running of the firm. Three other significant events happened that year. He was awarded the title of Master Goldsmith. Agathon Fabergé, his younger brother by 16 years, joined the business. While Agathon’s education was restricted to Dresden, he was noted as a talented designer who provided the business with fresh impetus, until his death 13 years later. Following Carl’s involvement with repairing and restoring objects in the Hermitage Museum, the firm was invited to exhibit at the Pan-Russian Exhibition in Moscow. One of the Fabergé pieces displayed at the Pan-Russian Exhibition was a replica of a 4th-century BC gold bangle from the Scythian Treasure in the Hermitage Museum. Tsar Alexander III declared that he could not distinguish Fabergé’s work from the original. He ordered that specimens of work by the House of Fabergé should be displayed in the Hermitage Museum as examples of superb contemporary Russian craftsmanship. In 1885, the House of Fabergé was bestowed with the coveted title "Goldsmith by special appointment to the Imperial Crown", beginning an association with the Russian tsars. In 1885, Tsar Alexander III commissioned the House of Fabergé to make an Easter egg as a gift for his wife, the Empress Maria Feodorovna. Its "shell" is enamelled on gold to represent a normal hen’s egg. This pulls apart to reveal a gold yolk, which in turn opens to produce a gold chicken that also opens to reveal a replica of the Imperial Crown from which a miniature ruby egg was suspended. Although the Crown and the miniature egg have been lost, the rest of the Hen Egg as it is known is now in the collection of Victor Vekselberg. 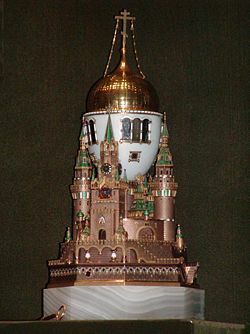 The tradition of the Tsar giving his Empress a surprise Easter egg by Carl Fabergé continued. From 1887, it appears that Carl Fabergé was given complete freedom as to the design of the Imperial Easter eggs as they became more elaborate. According to the Fabergé Family tradition, not even the Tsar knew what egg form they would take: the only stipulation was that each one should contain a surprise. The House of Fabergé completed 50 Imperial eggs for Alexander III to present to his Empress and for Nicholas II to present to his mother, the Dowager Empress Maria Feodorovna and his wife the Empress Alexandra Feodorovna. Of these, 43 are known to have survived. Amongst Fabergé’s more popular creations were the miniature hardstone carvings of people, animals and flowers carved from semi-precious or hardstones and embellished with precious metals and stones. The most common animal carvings were elephants and pigs but included custom made miniatures of pets of the British Royal family and other notables. The flower sculptures were complete figural tableaus, which included small vases in which carved flowers were permanently set, the vase and "water" were done in clear rock crystal (quartz) and the flowers in various hardstones and enamel. The figures were typically only 25–75 mm long or wide, with some larger and more rare figurines reaching 140–200 mm tall, and were collected throughout the world; the British Royal family has over 250 items in the Royal Collection, including pieces made by Michael Perkhin and Henrik Wigström. Other important Fabergé miniature collectors were Marjorie Merriweather Post, her niece Barbara Hutton and even Fabergé's competitor Cartier, who in 1910 purchased a pink jade pig and a carnelian (agate) fox with cabochon ruby eyes set in gold. The House of Fabergé also stocked a full range of jewellery and other ornamental objects. There were enamelled gold and silver gilt, as well as wooden photograph frames; gold and silver boxes; desk sets, walking sticks, doorbells and timepieces. Quality was assured by every article made being approved by Carl Fabergé, or in his absence by his eldest son Eugène, before it was placed into stock. The minutest of faults would result in rejection. The House of Fabergé won international awards and became Russia’s largest jewellery firm employing some 500 craftsmen and designers. In the early 20th century, the headquarters of the House of Fabergé moved to a purpose-built, four-storey building in Bolshaia Morskaia. Branches were also opened in Moscow, Odessa, Kiev and London. From England, the company made annual visits to the Far East. The House of Fabergé was nationalised by the Bolsheviks in 1918. In early October, Carl Fabergé left Petrograd on the last diplomatic train for Riga. The revolution in Latvia started in the middle of the following month, and Carl was again fleeing for his life to Germany, first to Bad Homburg and then to Wiesbaden in Germany. The Bolsheviks imprisoned his sons Agathon and Alexander. Initially, Agathon was released to value the valuables seized from the Imperial family, the aristocrats, wealthy merchants and Fabergé amongst other jewellers. He was re-imprisoned when the Bolsheviks found it difficult to sell this treasure at Agathon's valuations. With Europe awash with Russian jewels, prices had fallen. Madame Fabergé and her eldest son, Eugène, avoided capture by escaping under the cover of darkness through the snow-covered woods by sleigh and on foot. Towards the end of December 1918, they had crossed the border into the safety of Finland. Meanwhile, Carl Fabergé was in Germany and became seriously ill. Eugène reached Wiesbaden in June 1920 and accompanied his father to Switzerland, where other members of the family had taken refuge. Carl Fabergé died in Lausanne on 24 September 1920. His wife died in January 1925. Although Alexander managed to escape from prison when a friend bribed guards, Agathon did not succeed in making his escape from the USSR until November 1927 when Agathon, his wife Maria and son Oleg, together with four helpers, escaped by sledge under cover of darkness across the frozen Gulf of Finland. Agathon and his family spent the rest of their lives in Finland. In 1924, Alexander and Eugène opened Fabergé & Cie in Paris, where they had a modest success making the types of items that their father retailed years before. To distinguish their pieces from those made in Russia before the Revolution, they used the trademark FABERGÉ, PARIS, whereas the Russian company's trademark was just FABERGÉ. They also sold jewellery and had a sideline repairing and restoring the items that had been made by the original House of Fabergé. Fabergé & Cie lost a legal case in Hong Kong in 1984, in a dispute with Fabergé Inc. over trademark rights in the use of the name 'Fabergé' for jewelry. Fabergé & Cie continued to operate in Paris until 2001. The reputation of Fabergé as a producer of the highest standard was maintained by publications and major exhibitions, such as those at the Victoria & Albert Museum in 1994 and the Royal Collection in 2003–4. Following the end of the Soviet Union and the rise of the oligarchs, Russian collectors sought to repatriate many of Fabergé's works, and auction prices reached record highs. On 27 November 2007, the Rothschild Fabergé Egg was auctioned at Christie's in London for £8.98 million. The Rothschild Fabergé egg became the record price for a piece of Fabergé, as well as the highest price ever paid for a Russian object and the most expensive price for a timepiece. Many celebrities and billionaires collect Fabergé pieces, such as the late Joan Rivers, whose estate sold $2.2 million worth of Fabergé at auction. American oil billionaire Armand Hammer collected many Fabergé pieces during his business ventures in communist Russia in the 1920s. In 1937, Armand Hammer’s friend Samuel Rubin, owner of the Spanish Trading Corporation, which imported soap and olive oil, closed down his company because of the Spanish civil war and established a new enterprise to manufacture perfumes and toiletries. He registered it, at Hammer’s suggestion, as Fabergé Inc. in 1937. In 1943 Samuel Rubin registered the Fabergé trademark for perfume in the United States. In 1945 the Fabergé family discovered that their name was being used to sell perfumes without their consent. A lengthy exchange between lawyers on both sides of the Atlantic ensued. In 1946 Rubin registered the Fabergé trademark for jewellery in the United States. An agreement was reached out of court in 1951 with the family whereby Rubin agreed to pay Fabergé & Cie $25,000 to use the Fabergé name solely in relation to perfume. In 1964, Rubin sold Fabergé for $26 million to George Barrie and the Rayette Inc. The Cosmetics company Rayette changed its name in 1964 to Rayette-Fabergé Inc. and in 1971 the company name was changed to Fabergé Inc. In 1978 Michael J Stiker filed for the patent rights for Faberge jewelry in New York on behalf of Faberge & Cie in Paris, but this attempt to license the jewelry brand failed. From 1964 to 1984 under the direction of George Barrie many well known and successful product lines as well as feature movies were launched by Fabergé Inc.
Barrie supervised Fabergé's introduction of the Brut toiletry line for Fabergé, which was promoted by football player Joe Namath. In 1977, he signed Farrah Fawcett to a promotional contract with Fabergé for the Farrah Fawcett hair product and fragrance lines. A famous Fabergé TV advert featured Joe Namath being shaved by Farrah Fawcett. Brut became the best selling cologne in the world at the time, and remains available today worldwide. In 1967, film actor and businessman Cary Grant was appointed Creative Consultant, and in 1968 member of the Board of Directors of the company. Actor Roger Moore became a board member in 1970. George Barrie established Fabergé's filmmaking division, Brut Productions in 1970 and put together the Academy Award winning movie titled A Touch of Class in 1973 and other feature movies. Barrie launched the Babe fragrance in 1976, which in its first year became Fabergé's largest selling women's fragrance worldwide. Actress and model Margaux Hemingway received a $1 million contract to promote the perfume Babe by Fabergé in an advertising campaign making her the first super model. Babe received two awards from the Fragrance Foundation for its launch: Most Successful Introduction of a Women's Fragrance in Popular Distribution, and Best Advertising Campaign for Women's Fragrance. By 1984 the company had expanded its personal care products to Aphrodisia, Aqua Net Hair Spray, Babe, Cavale, Brut, Ceramic Nail glaze, Flambeau, Great Skin, Grande Finale, Just Wonderful, Macho, Kiku, Partage, Tip Top Accessories, Tigress, Woodhue, Xandu, Zizanie de Fragonard, Caryl Richards, Farrah Fawcett and Fabergé Organics. The company also bought other firms and products, including D-LANZ and BreastCare, a breast cancer screening device. In 1984, Meshulam Rikli's privately owned Riklis Family Corporation acquired Fabergé for $670 million. Many Faberge products including the original breast device D-LANZ are discontinued. The company launches Mcgregor by Fabergé (Cologne) the same year. New product lines were introduced including men's, women's and children's apparel under the trademarks Billy the Kid, Scoreboard and Wonderknit. In 1986 Mark Goldston, was named President of Fabergé. He was principally responsible for targeting and acquiring the Elizabeth Arden Company from Eli Lilly and Company for $725 million in 1986, turning Fabergé into a $1.2 billion firm. In 1989 Unilever bought Fabergé Inc. from the Riklis Family Corporation for US$1.55 billion. The company was renamed "Elida Fabergé". The deal now placed Unilever at equal first place with L'Oreal in the world cosmetics league, up from fourth place. Unilever registered the Fabergé name as a trademark across a wide range of merchandise internationally and granted licenses to third parties to make and sell a range of products ranging from custom jewelry to spectacles under the Fabergé name. However, it also continued to sell perfume and toiletries branded Fabergé. In pop culture the name Fabergé became synonymous with the ultimate in luxury when the Forbes Fabergé collection became widely publicised in the mid 1980s. In 1989 the German jewelry manufacture company Victor Mayer was given the exclusive licensing rights to produce heirloom quality Fabergé Eggs, jewelry and watches in 18KT gold and platinum with gem stones, vitreous enamel and diamonds. In collaboration with Fabergé expert Geza von Habsburg new designs for eggs and jewelry were marketed worldwide with great success and many large Fabergé eggs are now in collections and museums. The first contemporary Fabergé jewelry and egg collection was presented to the alleged heir to the Russian crown Grand Duke Vladimir Kirillovich of Russia in Munich, Germany in 1991. The license with the Victor Mayer company ended in 2009 for jewelry and in 2012 for watches. From 1989 to 2001 Unilever granted further licenses for Fabergé products to Limoges and The Franklin Mint for perfumes, dolls and other items. All licensed products of the time have ten identical trade mark or stamp, a Russian eagle with the words below: Fabergé Paris - London - New York. Lever Fabergé was formed in the UK early 2001, through the merger of the two long-established Unilever companies, Lever Brothers and Elida Fabergé. The new company, Lever Fabergé owned hundreds of cosmetics, household and other brands including Dove, Impulse, Sure, Lynx, Organics, Timotei, Signal, Persil, Comfort, Domestos, Surf, Sun, and Cif. This meant Lever Fabergé appeared on a range of products from bleach to toiletries. In a complicated series of events of personal and professional vendettas between the Russian oligarch and Faberge egg collector Victor Vekselberg and his business partner Brian Gilbertson (the former CEO of Mr Vekselberg's Siberian Urals Aluminium Company, or SUAL), Fabergé changed hands several times. Mr Gilbertson, who received a controversial package worth up to $38 million when he resigned from BHP-Billiton in 2003 after just six months as CEO, and Mr Vekselberg discussed starting an investment business together after Mr Gilbertson was appointed CEO of SUAL. They set up an initial investment joint venture, a complex Cayman Islands structure to be funded by Renova and managed by Mr Gilbertson. Things went awry in 2006, as the joint venture negotiated to buy the Fabergé name from Unilever. Mr Vekselberg (a connoisseur of Fabergé Imperial eggs who owns nine of the jewel-encrusted creations, having acquired the Forbes family collection in 2004 for a reported US$100 million), insisted that one of his personal companies (as opposed to the joint venture) get title to the brand, although the benefits of reviving the brand would stay within the joint venture fund. In 2004, Vekselberg purchased the largest Fabergé collection in existence form the Forbes family for 50 million pounds prior to it being auctioned. leaving him with the largest faberge jewelry collection but not with the Fabergé brand name. On 3 January 2007, Pallinghurst Resources LLP, an investment advisory firm based in London and of which Brian Gilbertson was a partner, announced that a Pallinghurst portfolio company had acquired Unilever’s entire global portfolio of trademarks, licenses and associated rights relating to the Fabergé brand name for a mere $38 million. The trademarks, licenses and associated rights were acquired by a newly constituted company, Fabergé Limited, which was registered in the Cayman Islands. In September 2009, Fabergé Limited launched its first collection of high jewellery as well as its website. In December of that year it opened a boutique in Geneva. By March 2010, only one of the licenses originally granted by Unilever remained in existence. On 6 July 2011 the company launched two collections of egg pendants, including a dozen high jewellery egg pendants. These were the first to have been made by a Fabergé reunited with the family since 1917. In November 2011 Fabergé was being sold in the Fine Jewellery Room at Harrods in London's Knightsbridge and later in the month Fabergé opened its own boutique on Grafton Street in the heart of London's Mayfair. In May 2012 Fabergé opened its own boutique on New York's Madison Avenue. In 2012, Brian Gilbertson's and a related trust on the one hand, Renova, Mr Vekselberg and Vladimir Kutnetsov met in court in the Cayman Islands over the original acquisition of the Faberge brand name from Unilever. The claim of Vekselberg to get damages from Mr Gilbertson (he made no claim over rights to the trademark) was dismissed in court. The judge called the lawsuit a personal fight between Gilbertson and Vekselberg. . Mr Vekselberg appealed the court's decision and the verdict is awaited. In January 2013, Fabergé Limited was sold to the gem mining company Gemfields for 142 million new shares in Gemfields plc with a value of $90 million at completion of the transaction. After the transaction, Mr Gilbertson, Pallinghurst and its co-investors held some 74% of Gemfields. Accounts filed with Companies House in the UK on 25 October 2015, show that Fabergé (UK) Limited, the principal trading entity lost £0.525 million for the year ending 30 June 2015. The accounts reveal that a significant spend in research and development was made during the year in respect of the new timepiece collections. These were successfully launched during the year. Indeed, in November 2015 Fabergé won a coveted Grand Prix d'Horlogerie de Genève award – the 'Ladies Hi Mechanical' prize. In 2017, the Head Office of FABERGE jewelry brand (which is located in London) noticed Mariana Voinova in the photographic project for L'Officiel Ukraine. Mariana was invited as ambassador to the Jewelry House in the spring of the same year and discharges her duties up to now. Mariana Voinova acts as the collection face, the ideological inspirational figure of the shooting, and the producer. On October 3, 2017 the Jewelry House Faberge unveiled both the male and female lines in its advertising campaign. Filip Wolfe, the famous Swedish mannequin, was the face of the men's collection of the brand and Mariana Voinova represented the women's collection. The shooting took place in London. In The Simpsons episode "'Round Springfield", it is revealed that the character Bleeding Gums Murphy spent all of his money on a "$1500 a day habit" by buying several Fabergé eggs a day. Gustav Fabergé monument was opened in Pärnu on 3 January 2015 in the year of the bicentenary of his birth. The bronze statue is a gift to the city from Alexander Tenzo, the founder of TENZO jewellery house. Composition authors Alexander Tenzo and Vladislav Yakovsky. Sculptor Eugeny Burkov. The statue was mounted with support of the City Government of Pärnu and Pärnu Fabergé Society represented by Tiina Ojaste and Toomas Kuter. ^ Lowes, Will; McCanless, Christel Ludewig (2001). Fabergé Eggs: A Retrospective Encyclopedia. Scarecrow Press. p. 195. ISBN 9780810839465. ^ "Gum pot in the form of an egg". Royal Collection Trust. Inventory no. 40148. ^ "Easter egg pendant". Royal Collection Trust. Inventory no. 18845. ^ "Faberge to Be Revived by Pallinghurst-Led Investment Group". Bloomberg. 24 October 2007. ^ "In The Matter of Trade Marks Ordinance" (PDF). Ipd.gov.hk. Retrieved 20 October 2016. ^ "Fabergé". Royalcollection.org.uk. Retrieved 20 October 2016. ^ "FABERGE - Trademark & Brand Information of FABERGE & CIE". Trademarkia.com. Retrieved 20 October 2016. ^ "Business – The fall & rise of Fabergé". Spoonfeedin.wordpress.com. 23 September 2009. Retrieved 20 October 2016. ^ "Unilever Sets $1.55 Billion Faberge Deal". The New York Times. 11 February 1989. ^ Butler, Ben. "Caymans court lambastes former BHP chief Brian Gilbertson". Smh.com.au. Retrieved 20 October 2016. ^ Vardi, Nathan (8 June 2011). "Fighting A Russian Billionaire For The Faberge Brand". Forbes.com. Retrieved 20 October 2016. ^ Bennett, Will (5 February 2004). "Billionaire buys £50m Fabergé eggs for Russia". The Daily Telegraph. Retrieved 20 October 2016. ^ "Fabergé revival and rubies to put a shine on Gemfields". Shares Magazine. Retrieved 20 October 2016. ^ "Gemfields buys Faberge to create gem champion". Reuters. 21 November 2016. ^ a b Butler, Ben. "Caymans court lambastes former BHP chief Brian Gilbertson". Smh.com.au. Retrieved 20 October 2016. ^ "Pallinghurst up, to sell Faberge stake". Iol.co.za. Retrieved 20 October 2016. ^ "Gemstone mining buys Faberge business". Smh.com.au. Retrieved 20 October 2016. ^ "FABERGE (UK) LIMITED – Filing history (free information from Companies House)". Beta.companieshouse.gov.uk. Retrieved 20 October 2016. ^ "Fabergé takes prize at the 'Oscars' of global watch industry, says Gemfields". Proactiveinvestors.co.uk. Retrieved 20 October 2016. ^ Algar, Selim (12 March 2015). "Fabergé: Same-name eatery is still ripping us off". New York Post. Retrieved 20 October 2016. ^ "'Round Springfield". The Simpsons. Season 6. Episode 125. 30 April 1995. Fox Broadcasting Company. Wikimedia Commons has media related to House of Fabergé.